The central Pyrenees offer not just majestic mountain views or ever-expanding ski resorts, but two pocket principalities that few Americans have ever seen, or perhaps heard of. One, Andorra, is the only Catalan-speaking nation with a seat in the UN and has a reputation in France and Spain for fine duty-free shopping. The other, the Val d’Aran, is politically a part of Spanish Catalonia—yet is separate from both Spain and Catalonia geographically and linguistically. Andorra and Aran—separated from each other by the Noguera Pallaresa river and an impassable stretch of peaks—feature the finest skiing in the Pyrenees and a summer carpet of high mountain hikes and dark stone villages clustered around ancient churches. 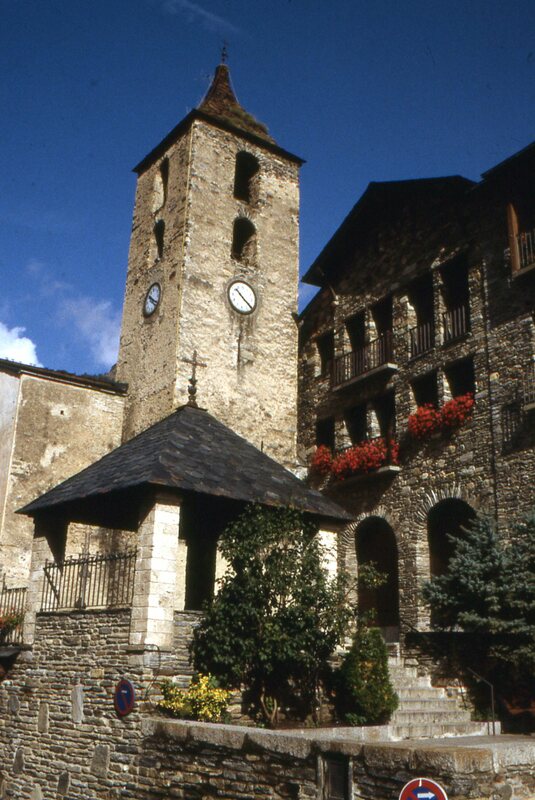 Despite modernization elsewhere in the country, the center of Ordino still typifies the old Andorran mountain village. Andorra is a tiny mountain kingdom—really just two valleys tucked into some of the highest parts of the Pyrenees—that has become a duty-free shopping haven because it’s right between France and Spain, yet is not part of the European Union. Gas costs about two-thirds what it does in France; a large bottle of Pastis goes for $3, perfumes are often half price, etc. But my family and I hadn’t come here to shop. We’d come to experience the mountains and, for me, to relive a very memorable previous visit. I spent a month in Andorra with my parents in the early fifties, at a time when there were only about 6,000 people living inside the principality. While we were there, my mother slipped in a mountain stream and had a miscarriage. Since there were no hospitals, she stayed in the front room of the local doctor’s house while she recovered. 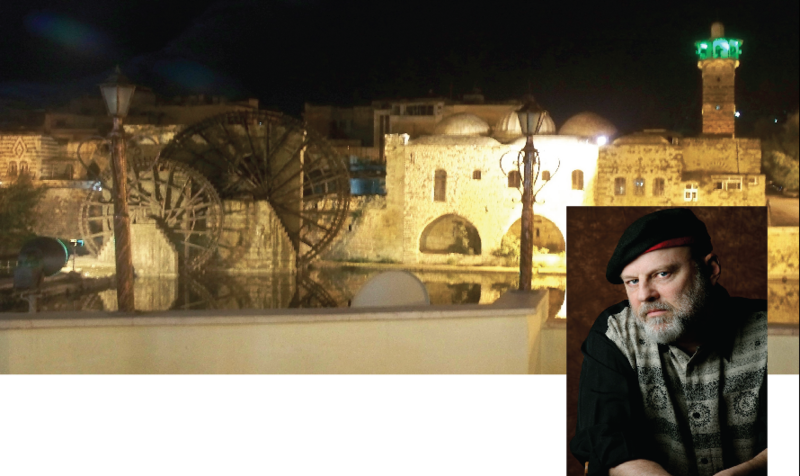 Dad and I camped in the main square of the capital, which was still used as a cow pasture and, by the end of our stay, had driven to the end of every road in the country. Now there are over 60,000 inhabitants and most of the little villages have been inundated with stores and ski chalets. Evan so, the country’s governance remains interesting. 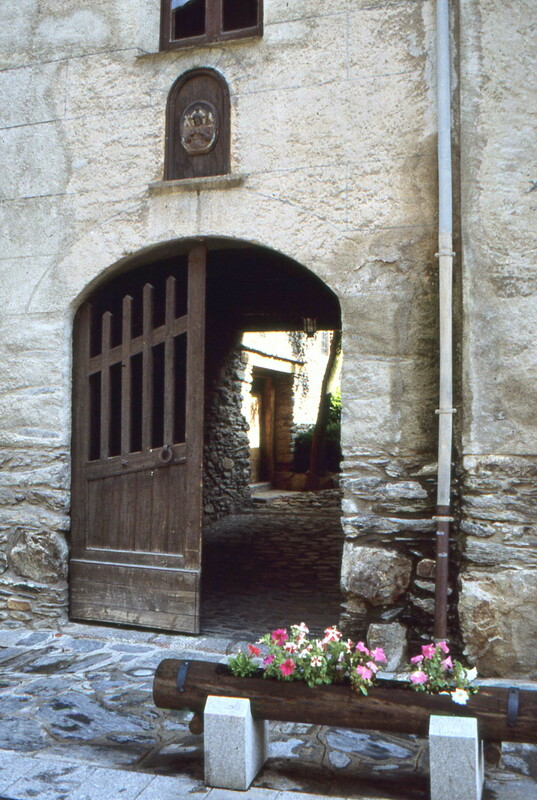 Since the 13th century it has been a co-principality, split between the Bishops of Seu d’Urgell in Spain and the Counts of Foix (now the President of France) in France. This dual rulership effectively kept either country from gobbling it up over the centuries. In 1993 the citizens voted for a parliamentary democracy, so the old rulers are now mere figureheads. We headed straight out of the border shopping town of Pas de la Casa, up over the highest road pass in the Pyrenees (Port d’Envalira, at 7,500 feet), along the main Andorran valley, and then up a side road and through some stunning scenery over another pass down into Ordino in its little side valley. The old core of town (everything built of grey stone, as are the new chalets, at least in Ordino) tumbled down a hillside, the buildings locked together to catch the sun. We wandered the alleys and churchyards, and then drove further up the valley beyond Llorts, to where we found a fine hiking trail along a mountain stream. Just enough ups and downs and bends to keep our youthful walkers interested, but nothing too severe. All around us were sun-dappled peaks, and the incongruous sight of tobacco fields. Tobacco is grown here despite the climate, because American tobacco companies will buy the entire mediocre harvest as a trade-off for selling their own US-grown product in the local shops. 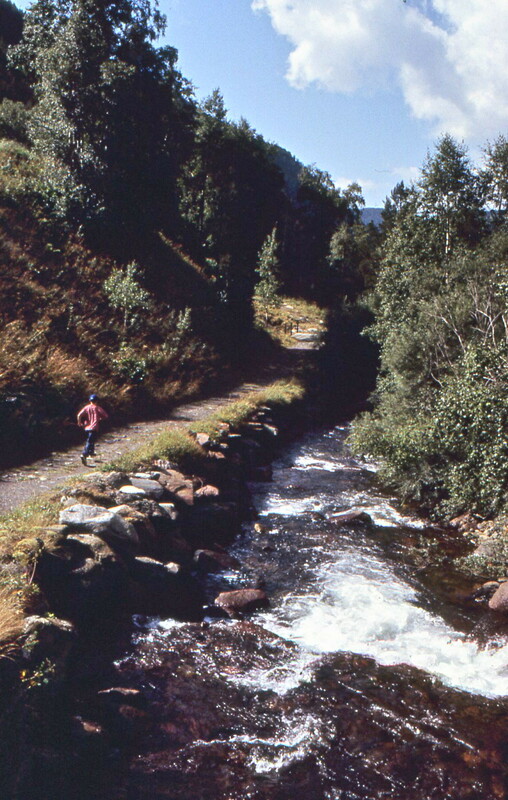 Andorra’s high valleys have mountain hikes for all ages and abilities. This nobleman’s house in Ordino is open for tours as well as free walks in the garden. For us, Ordino offered the best combination of traditional village and mountain-access point. But it’s not the only interesting spot in Andorra. While Andorra’s main activity seems to be duty-free shopping, which certainly suits some visitors, the non-commercially minded can sample other delights. In the capital, visit the Barri Antic (the tiny old town) and its centerpiece, the Casa de la Vall, which has served as Andorra’s parliament building since 1702. Or drop over to the amazing Caldea spa complex, which looks like a futuristic cathedral. A three hour admission lets you into an enormous heated lagoon and more saunas, baths, and hydromassage than anywhere else in Europe. 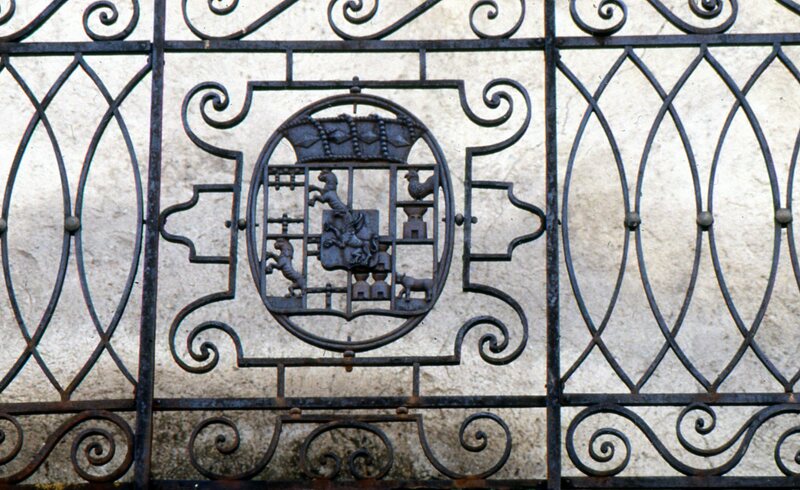 The summer house of Andorra’s iron-smelting “tycoon” weaves his coat of arms into elaborate wrought-iron work. In the winter, of course, there is skiing. Whether you’re a beginner or an expert, a range of slopes beckon. Pas de la Casa (on the French border) has the liveliest apres-ski nightlife, but it’s Soldeu-El Tarter that draws the biggest raves for slopes. This entry was posted in Uncategorized and tagged Catalan, Daniel Gabriel; Minnesota author; Andorra; principality of Andorra; Ordino; hiking; mountain villages on March 29, 2017 by danielgabriel.